View cart “All Star CIN Baseball Bar Mitzvah Invitation” has been added to your cart. This fun save the date card will generate lots of excitement for your son’s baseball inspired Bar Mitzvah celebration! 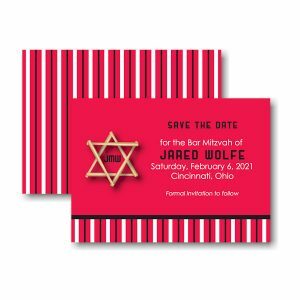 Digitally printed on both sides of 130# card stock, this save the date features a Jewish star of David made of interlocking baseball bats on the left. The Black and White striped pattern at the bottom continues on the reverse side and is displayed against a Cincinnati Red background. This fun save the date card will generate lots of excitement for your son’s baseball inspired Bar Mitzvah celebration! 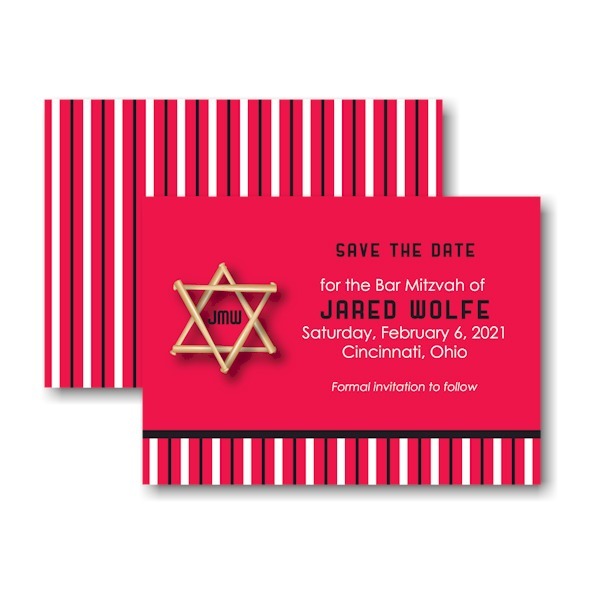 Digitally printed on both sides of 130# card stock, this save the date features a Jewish star of David made of interlocking baseball bats on the left. The Black and White striped pattern at the bottom continues on the reverse side and is displayed against a Cincinnati Red background. Measures 5″ wide by 3-1/2″ high. Shown with white/black inks and combination lettering styles Century Gothic Regular and Stadium Regular. Single white envelopes accompany this save the date card.